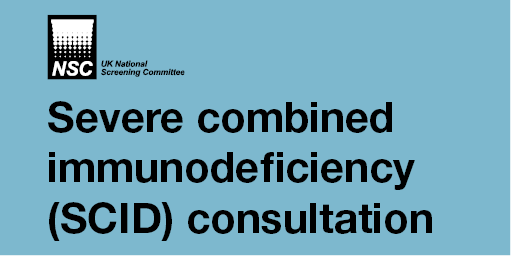 The UK National Screening Committee (UK NSC) is consulting publicly on whether an evaluation of screening for severe combined immunodeficiency (SCID) should be undertaken in the NHS. The UK NSC regularly reviews its recommendations on screening for different conditions every three years or in the light of new research evidence becoming available. The last review of screening for SCID was completed in 2013. SCID refers to some rare inherited conditions which affect the development of the baby’s white blood cells which are a crucial part of our immune system. These conditions make it more difficult for babies to fight off infections from about 3 months of age. Around 15 to 25 babies are born with the condition every year. Infections that are not serious in most babies can be life threatening in those with SCID. The treatment is a bone marrow transplant, which can repair the damaged immune system. Newborn screening, as part of the newborn blood spot screening programme, would look for babies with low numbers of white blood cells as a sign that they may have SCID. Early detection can improve the success of the transplants. This is because doctors can help the baby to avoid infections before the transplant if they know the baby has SCID. In an earlier step in the review process, the UK NSC found that screening for SCID is likely to be effective in increasing the number of babies who survive before and after transplant. But the evidence is uncertain in some areas. These, and other, issues can only be evaluated by trying screening for SCID in a large number of babies. The UK NSC is proposing that this should be attempted in the UK as it would help the Committee decide whether screening should be part of the newborn blood spot screening programme. The consultation is an opportunity for stakeholders to comment on this proposal.